It's a shame that the once-vibrant career of Joe Dante has gone nowhere in recent years, because Dante's Inferno would have been preferable to Ron Howard's Inferno (*1/2 out of four). With such efforts as The Howling, Gremlins and Piranha, Dante was efficient at adding welcome strains of tongue-in-cheek humor to further distinguish his outlandish yet consistently amusing fantasy flicks. Howard, on the other hand, is at that post-Oscar point in his career where most of his projects are weighted down with misplaced import, and nowhere is this more evident than in this daft and humorless adaptation of Dan Brown's bestselling novel. This is the third Brown book to be turned into a major motion picture directed by Howard and starring Tom Hanks, and it's the lamest one yet. Like those ridiculous National Treasure flicks featuring Nicolas Cage as a nerdy Indiana Jones, the three films showcasing Hanks as Harvard symbologist Robert Langdon position themselves as brainy action yarns, with the hero pausing during lengthy chases to rattle off historical tidbits regarding Leonardo Da Vinci (2006's The Da Vinci Code) or the Catholic Church (2009's Angels & Demons) or Dante Alighieri (this entry). 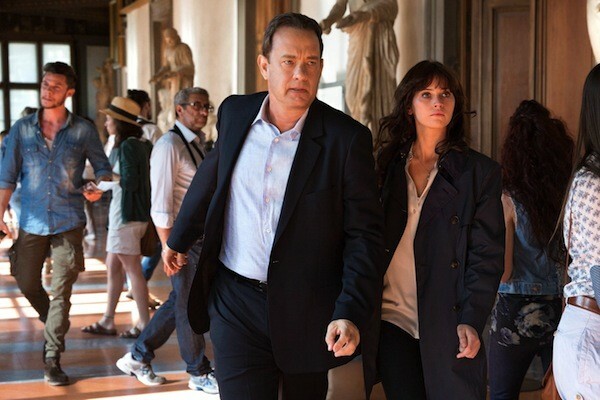 But as a character, Langdon has even less dimensions than the more animated sleuths Carmen Sandiego and Dora the Explorer, and it's sad seeing Hanks wasting his talents in such a gossamery role. The central thrust of Inferno is that Bertrand Zobrist (Ben Foster), a wealthy motivational speaker who comes off like a cross between conspiracy nut Alex Jones and Elevation Church con man Steven Furtick, decides that the only way this overpopulated planet can be saved is by unleashing his own moonshine mix of a virus, one designed to serve as another Black Plague and kill off half the world's citizenry. Since the movie would only run 10 minutes if Zobrist did the logical thing and released it ASAP, he instead plots out an alternate course of action that his groupies are to follow if he dies (which he does within the film's first few minutes). But he illogically crafts a needlessly complicated puzzle wherein even his followers have to piece together clues to ascertain the whereabouts of the deadly strain. (Wouldn't instant, easy access make more sense? Or did his followers decide they'd be too busy watching the current season of The Walking Dead so no real rush on destroying the world?) This protracted plan allows not only Langdon and World Health Organization suits to have a shot at locating and neutralizing the virus but also opens the door for nefarious characters to nab it first and sell it to the highest bidder (this doesn't really make sense, given the indiscriminate and widespread nature of this uncontrollable disease, but there ya go). When it's not being dense, Inferno settles for being dull, since the pattern has been largely the same in all three films: See Langdon run! 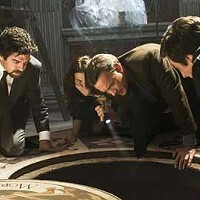 See Langdon solve puzzles! See a hottie (in this case, Felicity Jones) trot along behind Langdon, breathlessly hanging onto his every word! At least the locales are lovely (lots of shots of Venice), and there's an interesting performance by reliable Irrfan Khan as the head of a clandestine outfit that traffics in assassinations as well as in sleight-of-hand scenarios more suited to a Now You See Me romp. In all other respects, though, Inferno quickly goes down in flames.